Get $15 OFF Save $15 TurboTax Self-Employed with instant coupon. 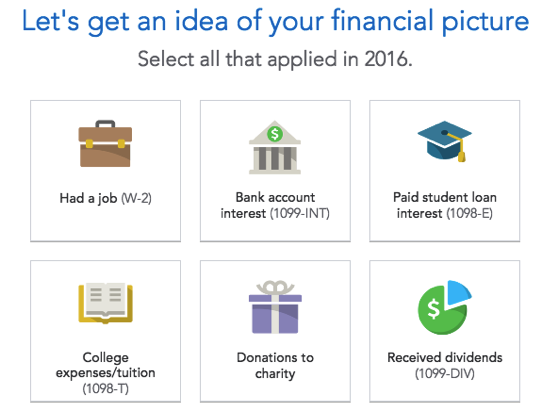 To help you file your taxes in time this year (and hopefully get your big refund check early too!) TurboTax is offering $15.00 off the new Self-Employed version if you file by April 15, 2019. This version replaces the online version of Home & Business and is perfect for those that need to file both business and personal taxes this year. If you’re unsure if this version is right for you, you’ll be able to start your return online for free and you’ll only be asked to pay if you decide to file with TurboTax. See site for full offer details. Try it Free Try out TurboTax Self-Employeed for free. If you haven’t used TurboTax before or your switching from another tax preparation program, then you’ll be able to try any of the online versions of TurboTax for free, including Self-Employed. As with all of TurboTax’s Online Editions, there is no software to install as you work as go through your online account at Intuit.com. Then if you decide to file with them, either a Federal return or both a Federal and State return, then you can pay for their program. H&R Block offers a similar free trial offer. TurboTax Self-Employed is the latest addition to the line of online products offered by Intuit. It isn’t completely a new product but a revamped version of the previous Home & Business (Home & Business is still available as a download or on a CD.) It is meant for freelancers, contractors and small business or farm owners, and built to provide features that capture activities related to independent work. With TurboTax Self-Employed you can expect the same quality product with industry specific deductions and credits. It also comes with one-year subscription to QuickBooks Self-Employed allowing you to track expenses as you go, automatically track mileage and store digital copies of your receipts. All this information can be later imported to TurboTax and populate all the right fields to save you time. – Where you lived at the end of the last calendar year (zip code only). – Whether any of the following apply: Owned a home, rented, or was a student. After this initial step you can provide even more details of what happened to you financially in the prior year. Those situations may or may not apply to everyone, but disclosing as much information as possible will help generate the most accurate tax return. Once you select all that applies, the software creates a summary of the information you provided and begin the portion of entering the details of different forms you selected. Up until this point, it shouldn’t take you more that 30 minutes to get to this point and that includes setting up the account. The next stage will vary in time based on complexity of your work and number of forms you received. This section involves answering additional personal questions (social security number, whether or not someone can claim you as a dependent, etc.) and providing income and expenses details for federal and state taxes. You can easily switch between any of these options in case your preference is different from what is suggested by the program. This process can be quite exhausting especially if you’re trying to get it all done in one sitting. Plan accordingly and know that there aren’t really any shortcuts. Despite the fact that TurboTax is able to import W-2 forms from hundreds of employers (this could be a potential shortcut), this doesn’t apply to 1099 forms. Preparing taxes on your own may be confusing at times and TurboTax relies on economies of scale. What I mean by that is the company has enough clients it can provide tips and suggestions to the most common conundrums. It often lists typically asked questions and answers for you to gain clarity on the issue you are currently working on. If that’s not sufficient, you can access SmartLook – an online help. By selecting Contact Us you will be able to chat with tax professionals either from your computer or a smart phone. – Encryption standards exceeding required norms. – Notifications to any changes made to your account. According to one CNN Money article, the Intuit CEO disclosed that in 2017 the gig economy in America accounted for 34% of workforce and it’s expected to climb to 43% by 2020. Even though those numbers are in flux, there is no doubt that many of us either work independently or have a side venture. 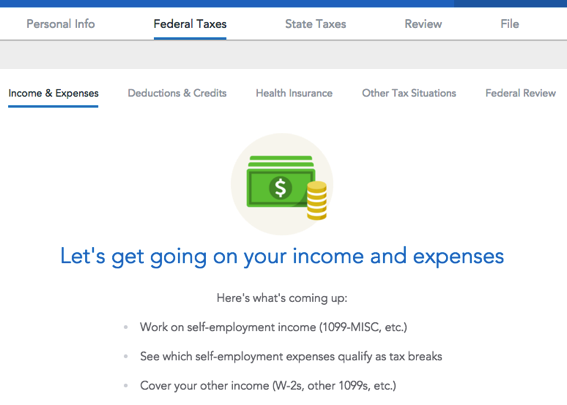 To address the need of taxpayers who need to report self-employed income or a mix of personal and business income Intuit, the maker of TurboTax, created Self-Employed version. If you’re unsure whether you are self-employed then think of all the ways you generated income last year. If you are an independent contractor, freelancer, consultant, or sole proprietor then this version is the right solution to file tax returns. One of the strongest suits of this version is the industry specific deductions. The software analyzes over 350 deductions and credits and is updated to address any line of work. Its objective is to evaluate and apply every deduction to your specific situation to maximize your refund or minimize the tax liability. I typically use a standard deduction and that works best for me, but the neat thing about this product is that it asks you whether or not you would like to try itemized deduction. Doing it does take more time because that’s when you have to get detailed about all your expenditures, but it may be justified and worth it. In my case the itemized deductions didn’t result in higher refund (at least in recent years) and I seamlessly switched back to standard deduction. – Capture receipts with your smart phone – this eliminates keeping shoe boxes of receipts; once you take a picture, the software stores the receipt for you so no worries about losing the receipts; it also helps to categorize all payments. – Track expenditures in real time – by saving the digital copies of your receipts and categorizing them on ongoing bases, you see the up to date financial picture of your business. – Track mileage automatically – with the help of your smart phone you can now keep a log of all the trips you’ve taken and it will automatically calculate the mileage. – Homeownership – everything from mortgage interest, property taxes, refinancing, points, and spending on energy efficiency. – Life changes – calculates impact of job or location changes, new family members, purchase of new property. – Asset depreciation – evaluates different depreciation methods and suggests the most beneficial to your situation. – Eeducation – tuition, student loan interest, education tax credits, and handles forms 1098-E and 1098-T.
Last but not least – what about the security? In today’s digital world security is the integral part of the product itself. When filing taxes people share the most critical details of their lives. Security is critical because it is required, not just necessary, to gain customers’ trust and bring them back over and over again. That is why TurboTax implements multiple safeguards to protect your information. Arguably the most important is data encryption. Information exchange with the IRS uses SSL encryption and even implementing higher than required standards set by the IRS. Protection also includes multi-factor authentication and Touch ID. You also have access to login and device history to monitor your account. Account Settings display dates and locations the account was accessed. TurboTax also sends email notifications if there are any changes to the account, in particular those related to payment method, password change, or signing in using a new device. If you’re in search for the top of the line tax filing product, TurboTaxLive Self-Employed version certainly fits the bill. It is the most comprehensive version covering all tax scenarios that comes with all year support of a CPA or Enrolled Agent (EA). It allows you to connect and speak to a seasoned tax accountant who will help you make decisions when filing taxes and review any aspect of your return. For starters, TurboTaxLive Self-Employed is equipped with the latest tax regulations and uncluttered interface to help you progress from one tax scenario to another. Clear interface is one of the product’s biggest strengths. At any point, you know exactly where you are in the return, and how much more ground you have to cover. Although it’s ideal to go step by step when preparing the return, I jumped around on some occasions. For example, start with the state rather than federal return. It is equally easy to skip between different categories of questions: Wages & Income, Credits & Deductions, Tax Situations, etc. Software saves your progress every time you change windows making it easy to go back and forth. It also adds another benefit: accessing the return where you left off from any device. You can work from your computer, tablet, or a phone and switch as you please. Your input is saved at all times. The ability to speak to a CPA or EA throughout the year makes this version so appealing. Taxes can get difficult, especially when combining business and personal income and expenditures. But having an unlimited access to tax pros throughout the year takes the guesswork out of equation. Just call and discuss your particular situation. CPAs can even go over the entire return line by line so that you understand it and know it is error free. 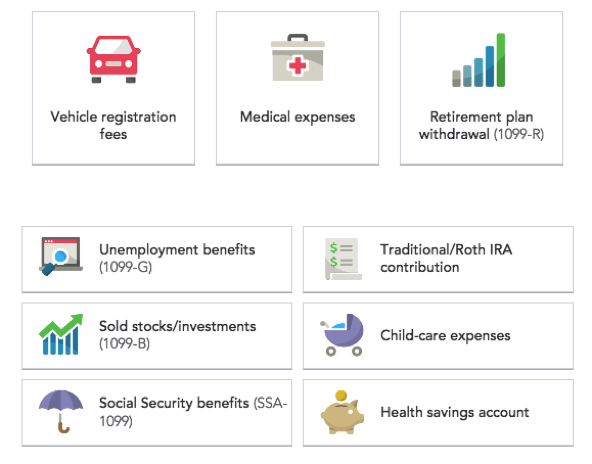 TurboTaxLive Self-Employed 2019 facilitates reporting your investments. There are many financial institutions that allow TurboTax to import your data. If you happen to trade in and out of positions, this can significantly shorten the time needed to sort all this out, not to mention eliminate potential mistakes. TurboTax will then help divide transactions between short and long term and create tax forms required by the IRS. New this year is ability to report proceeds or losses from cryptocurrency trading. With so much wealth generated in cryptocurrencies in 2017, the IRS determined that those transactions be reported as well. Whether you trade, mine, or get paid in cryptocurrency, you must report it. The software allows to import that information as well and does the rest of the reporting automatically. Another strong feature of Self-Employed 2019 version is that it includes QuickBooks. For transparency, it does require additional payment but it is up to each business owner to determine whether or not the benefits outweigh the costs. The software comes as a monthly subscription at a reasonable price. So, what about the benefits? Track income and expenses – link your bank account to QuickBooks and import transactions; as you categorize expenses the software learns the vendors and categories and begins doing it automatically for you. Capture and organize receipts – take a picture or forward from an email and store it; all information is saved and ready at the tax filing season. Estimate quarterly taxes – QuickBooks does the work of estimating tax payments and sends reminders to help avoid late fees. Track miles – use your phone to track business trips; save the information and pull it up when you’re ready to file. Last but not least, TurboTax goes over all deductions and credits to ensure the maximum possible refund. As the credits and deductions are applied in your return, you see immediately how they impact your refund. With that comes ExplainWhy feature that provides additional explanation why a particular credit or deduction impacted your bottom line. Then let the tax pros review your return for accuracy so you can have a peace of mind that you got the most money back and all calculations are accurate. The best possible scenario to complete the tax season.